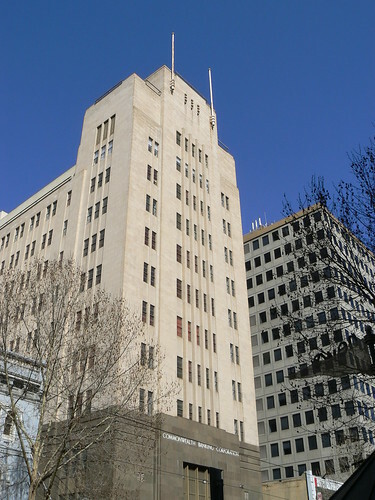 The former Commonwealth Bank building at 225 Bourke St, Melbourne was designed by W Henderson and constructed 1939-1941. Agreed Thomas, a lovely building, and by Melbourne standards of the time, a genuine skyscraper. I remember seeing your post a little while back and as always your photo was outstanding. Happy New Year and Best Wishes for everything down Tassie way. Happy New Year to you David, I look forward to checking out your future posts throughout 2011! Golden Age Motel in Omeo Victoria is a good one and it's surprising where else they pop up in regional and rural Victoria. 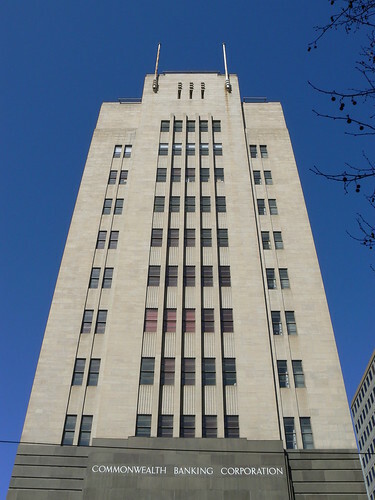 Saddest of all though recently was the loss of the Elizabeth Tower Hotel in Carlton. Thanks, I'll have to check out Omeo. I agree about the Elizabeth Tower. I can still see Lucky Grills as Bluey running up those stairs. It's bound to be on YouTube if I could find it.